Rescue Mages Guild members from Coldharbour's justice. Court of Contempt — Save the captive Mages Guild conjurers. Some of the mages who helped open the initial portal to Coldharbour were captured when they arrived. Now they're prisoners in the Daedric Court of Contempt, awaiting the verdict of Judge Xiven in the Hall of Judgment. Destroy the elemental crystals and collect the gate key. Find Malkur Valos at the entrance to the Hall of Judgment. Enter the Holding Cells and free the mages. Meet the mages outside the Court. You meet Malkur Valos as you approach the Court of Contempt. He asks for assistance in saving some Mage Guild members who were captured, taken to the Hall of Justice and put on trial by Judge Xiven. You are required to destroy three elemental crystals to lower the barrier preventing access to the hall and recover a key to the gate from the coffers to the north. The three crystals are found in the SE, SW and NW corners of the main courtyard area. Once you've destroyed the crystals and recovered the key you need to make your way to the entrance, where you will find Malkur raising flame atronachs. He informs you that the guild members have been found guilty, sentenced to death and taken to the cells beneath the hall. Once inside the inner courtyard, if you speak to Malkur again he will inform you that he will hold the gate while you rescue the mages. The inner courtyard is guarded by Magistrate Bogtro, a Xivkyn. There are five doors off of the courtyard, but only the center door can be used. Through the door is a large room with many large cages, three of which contain the mages; Tarrami, Dithis Romori and Denthis Romori. There is a backpack near the center of the room containing the key to the cages. Once you've released them you need to speak to Tarrami. 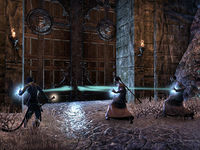 The mages run off and open a portal to the Hollow City, speak to Malkur to receive Arbiter's Vambraces and complete the quest. You can use the portal to move directly to the Hollow City. After completing this quest, the Library in The Hollow City is unlocked, and the four mages (and some other unnamed mages) can be found in and around the building. I need to destroy the three elemental crystals inside the three towers to bring down the magical barrier protecting the entrance to the hall. I also need to collect the gate key from the guarded coffer in the northern section of the ruins. I destroyed the elemental crystals and collected the gate key. Now I should meet Malkur Valos at the entrance to the Hall of Judgment. I gave the gate key to Malkur. I should follow him into the Hall of Judgment. The captured mages are being held in cells below the Hall of Judgment. I should enter the holding cells and locate them. One of the captured mages said that the key to the cages is on the table. I should find the key. I have the key to the cages. Now I should free the captured members of the Mages Guild. Now that the mages have been released from their cells, I should talk to Tarrami. The rescued mages have headed outside to meet up with Malkur. I should join them. The way out has been blocked by a shield spell. The rescued mages can disrupt the spell, but they need time to accomplish that. I should defend them while they work to open the gate. I defended the mages and they were able to defeat the spell blocking the way out. We can leave the Hall of Judgment now. Finishes quest I found the mages on the road outside the Court of Contempt. They've even already opened a portal. I should talk to Malkur Valos and make sure they're all right. This page was last modified on 2 February 2019, at 04:46.